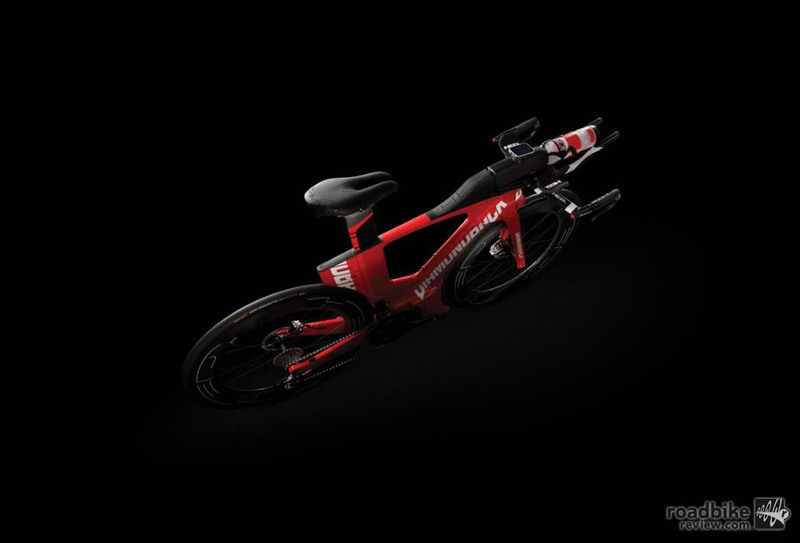 The wild looking Andean is Diamondback’s new entry into the triathlon market. 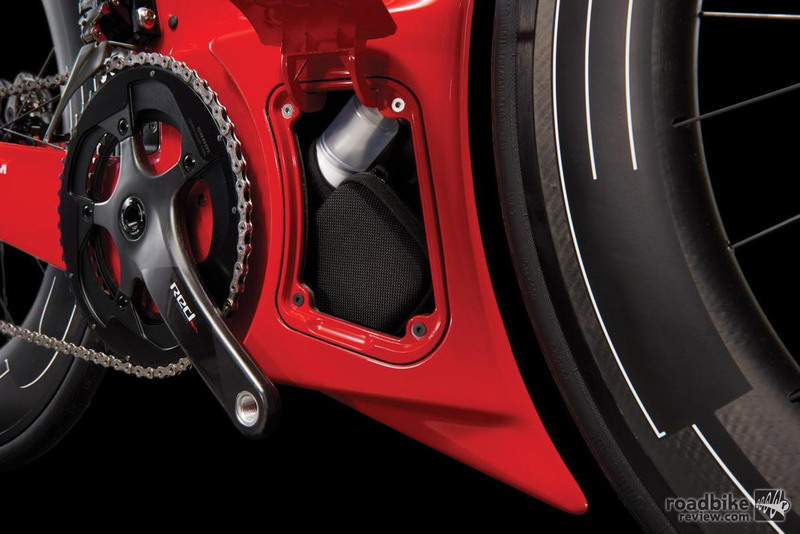 In 2014, Diamondback entered the triathlon/time trial market with the Serios. This model helped Michael Weiss set three Ironman course records, and carried the Rally Cycling race team to a U.S. men’s team time trial championship in 2016. In developing the Serios, a UCI approved bike, Diamondback came to the conclusion that most triathlons were being raced on modified road bikes. They wanted to build something purpose built for that discipline, which spurred a two-year long development program. 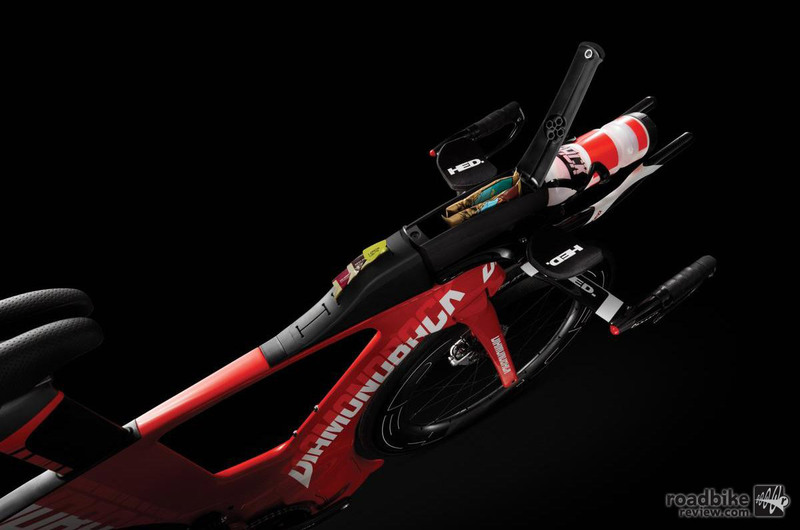 Diamondback claims this is the world’s fastest triathlon bike. The end result is the Andean, a revolutionary-looking new tri bike that was designed as a completely integrated system. From wheels to hydration, Diamondback worked to create a frame that not only delivered improved aerodynamic performance, but offered best in class storage and accessibility. To achieve this goal, Diamondback partnered with Kevin Quan Studios and Aerospace Professor Dr. Philippe Lavoie of UTIAS. Together they come up with the Aero Core philosophy, which improves aerodynamics by connecting the two wheels via a large airfoil. This helps improve the flow across the entire bike, particularly the middle section of the wheels, typically a weak point in wind tunnel testing. 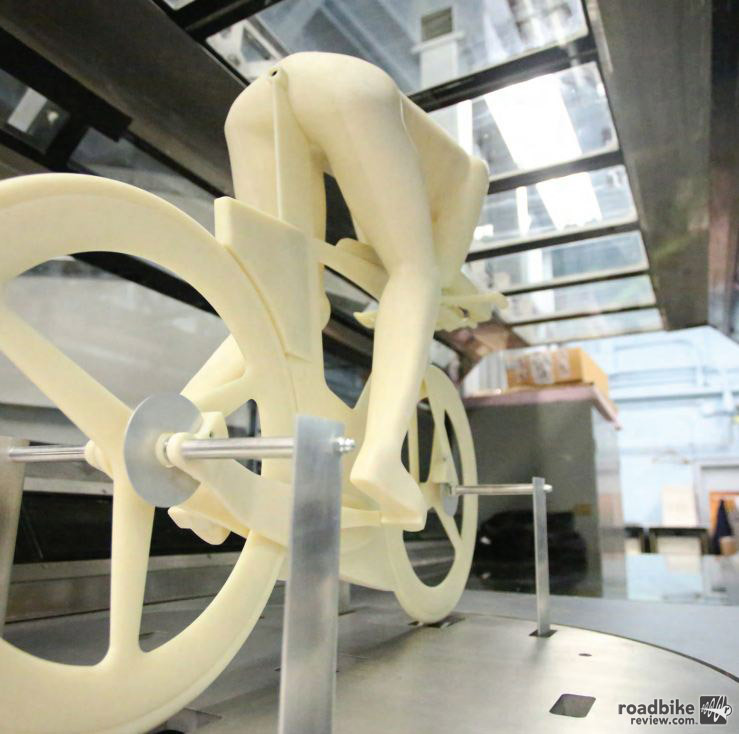 Most brands use half scale testing for tube shapes or individual components, but Diamondback worked with Dr. Lavoie to prove the performance of a bike and rider before moving onto to full-scale testing. Diamondback proved this concept by testing in a half scale tunnel. Using this smaller space, they were able to reduce the number of variables, which meant higher repeatability and more accurate testing. Testing at this scale also allowed them to use rapid prototyping to test how different elements would perform. For example, they evaluated 30 different fork variations alone. Once satisfied with their results at half scale, they moved to the wind tunnel. Their baseline test was using a Serios with HED Corsair Aerobar, HED Jet 6 wheels, and no storage components. This run is depicted in grey. 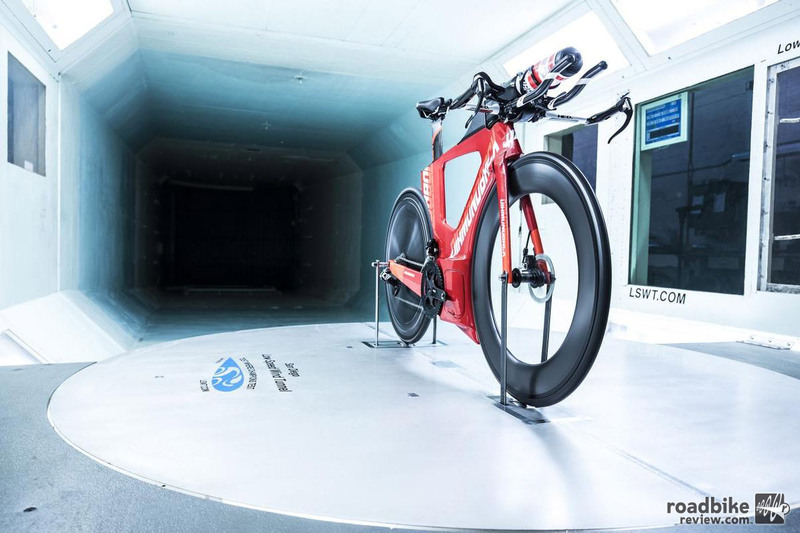 Test data from the Diamondback Andean wind tunnel testing. 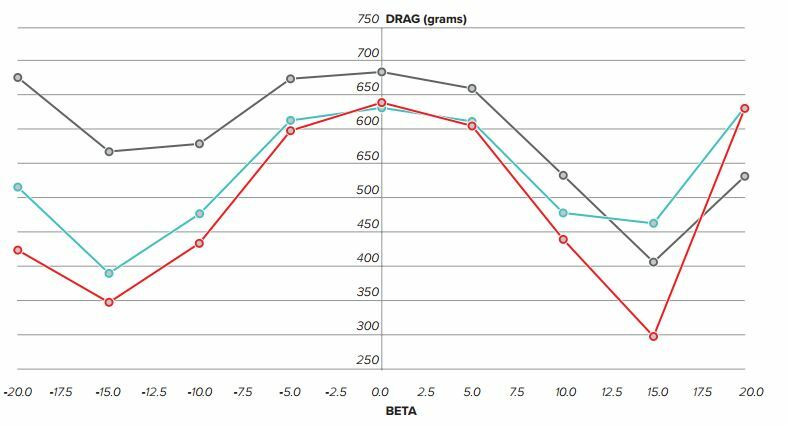 The blue line represents the performance of the new Diamondback Andean with identical components. In this test, the Andean is 10% faster at zero degrees and has 32% less drag at -15 degrees. The red line depicts the performance of the Andean at its fastest configuration with a HED Jet Disc rear wheel and all of its storage accessories. The Andean was designed to carry Rachel McBride’s preferred cargo: two energy bars, 10 gels, and salt tabs. 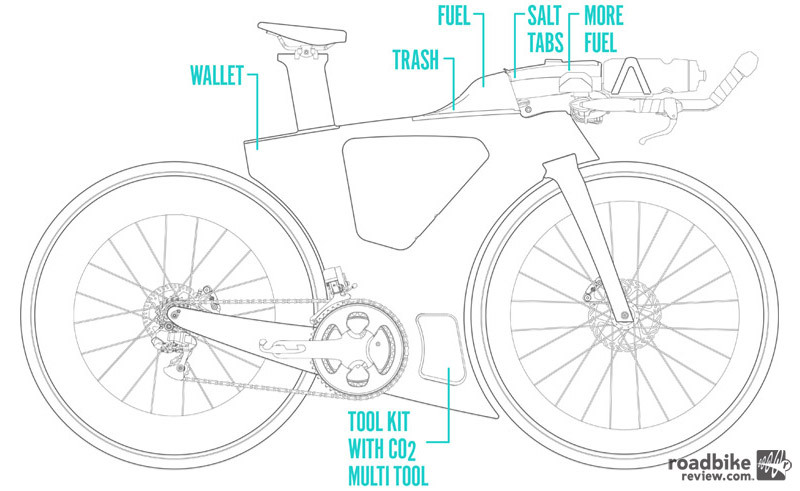 Speaking of storage, the frame has integrated storage tubes to allow the rider to carry three water bottles, three bars, 10 gel packets, and a spare tube. No taping or additional accessories required. Another thing worth noting is the brakes. Disc brakes are currently banned under UCI and ITU rules, but that hasn’t stopped a number of brands from announcing disc-only tri bikes. Many brands, including Diamondback, believe it’s only a matter of time before the rules change. Until then, the Andean can only be raced at Ironman competitions, events held under WTC rules, and other races sanctioned by bodies that allow disc brakes. The Andean is available for pre-order now at Diamonback.com and the first bikes are scheduled to ship at the end of January. The top of the line model includes Dura-Ace hydro disc brakes, Di2 electronic-shifting drivetrain, and HED Jet Black 9 wheels for $8,070. The base model retails for $4,800 and comes with a SRAM Force 1x drivetrain and HED Ardennes Plus wheels. For more info, visit www.diamondback.com. The wild looking Andean is Diamondback’s new entry into the tri market. 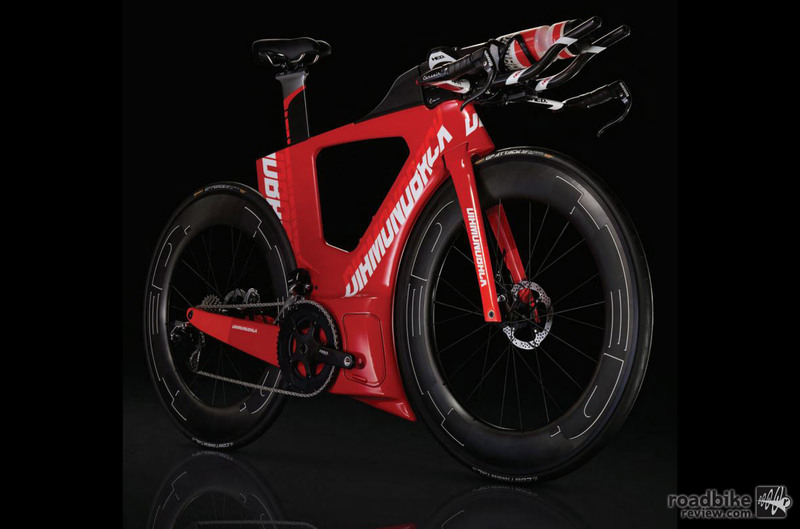 Diamondback claims this is the world’s fastest tri bike. The Andean was designed to carry Rachel McBride’s preferred cargo: two energy bars, ten gels, and salt tabs.